View More In Collectible Buildings & Accessories - Page 2. When temperatures drop below freezing, our thoughts turn to winter activities and celebrations. Sparkling like the facets of a magnificent icy jewel, this intricate structure is a spectacular center of attention for everyone in the city. The building features silver accents and ice sculptures that move around the center of the palace on a rotating ice rink. The dome of Ice Castle changes colors from sapphire to magenta to emerald. Two bears guard icy pathway to palace entrance. 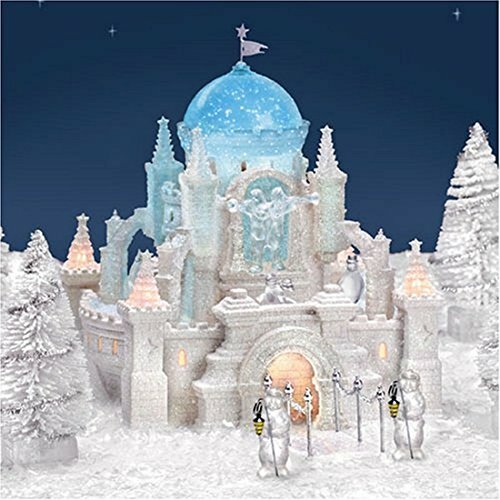 Also includes 4 white sisal trees with silver garland and a bag of snow crystals. Size: 9 x 8.75 x 10, 6.5, 2.5 x 2.5, 1"